Happy 2013! It might already be a little late for wishing people a happy new year, but I think its better late than never! This year will be very exciting for the bandit household – the end of student life, the start of married life and no doubt a whole load of baking adventures in between. However, the next few months are going to be a bit hectic, as I finish my PhD, start work and try and plan our wedding, so there might not be too many posts between now and Easter. To keep you all going, I thought a retrospective post about a little experimental cheesecaking (a new word for a new year) was in order. Now the first time I made this cake (on New Years Eve) it didn’t work entirely to my liking; the bananas weren’t quite right. So a week later I tried it again, changing up the banana part and making it in cupcake form. This method would easily work in a normal cheesecake shape as well, and I’ve included a photo of version 1 to show you what it would look like. The great thing about the mini versions is that they are easily transportable and far less messy – always a good thing with cake! This recipe is for 12-14 mini cakes. If you would like to make one large cheesecake (in a deep 20cm round tin) you will need to DOUBLE all the quantities. INGREDIENTS: 8-10 digestive biscuits (you might find you have leftovers), 30g butter, 1 tbsp golden syrup, 300g cream cheese, 50g caster sugar, 1 tbsp plain flour, 2 tsp vanilla extract, 75ml sour cream, 150g white chocolate, 2 very ripe bananas, can of carnation caramel (or equivalent). Heat the oven to 160 (fan, centigrade) and get a muffin tray ready with paper liner inserts. Put the butter and the golden syrup in a small pan and melt together over a low heat. Meanwhile, either put the biscuits in a freezer bag and beat the living daylights out of them with a rolling pin, or put them in the food processor. If doing the latter, when the butter mixture is melted, add to the food processor and give the whole lot a whizz. Otherwise put it all in a bowl and mix well. Line the base of each muffin case with some of the biscuit mixture and press down well. You want a reasonable layer in each case, but not too thick, certainly less than a centimetre. Then pop the tray in the oven for ten minutes. After ten minutes, take the tray out and use the back of a teaspoon to flatten the mixture again (while still warm). Leave to cool and turn the oven down to 140. Melt the white chocolate. I do this in 20 second intervals in the microwave but you can use a bowl over a pan of water if you prefer. With a mixer, beat the cream cheese, sugar, flour and vanilla until as smooth as possible. Add one and a half of the eggs (but keep the other half – and don’t worry about not being too exact), the melted chocolate and sour cream and beat again until really smooth. In the food processor whizz up the two bananas, adding in two tbsp of the cream cheese mixture, and the other half of the egg. It will be sloppy but don’t worry – it all works out great! NB: If you are making this as one large cake, just mash the bananas with the back of a fork until really mushy and mix in the egg – don’t whizz until completely liquid as the cake is too large and it may not set properly. It will still taste exactly the same! Take the cooled biscuit bases, and pour a layer of the banana mixture into the base of each case. Don’t do this until you’re ready to put them in the oven as if you leave it to sit, you’ll have a soggy bottom! On top of the banana mix, put a full tablespoon of the thick cream cheese mixture. You want the case to be about 3/4 full at this stage, so add a bit more or less depending on the size of your spoon. Don’t worry if the banana mixture comes up around the sides, it sorts itself out in the oven. Smooth other the mixture as best you can, but there’s no need to be too neat about it. Next comes the caramel. I find it best to put the caramel into a bowl and heat in the microwave for about 20 seconds, before beating quite hard with a fork. This gets out all the lumps that form when you use it from cold. Put a generous teaspoon of caramel in the middle of each cake. Finally, pop them in the oven for about 25 minutes. You want the tops to be slightly wobbly in the centre (although this can be a bit hard to see through the caramel! ), as they finish cooking at they cool, so keep an eye on them and take them out early if they are looking a bit hard. They shouldn’t go golden/brown. If you are making this as one large cake, I recommend baking without the caramel, and covering the cake onces it has cooled. 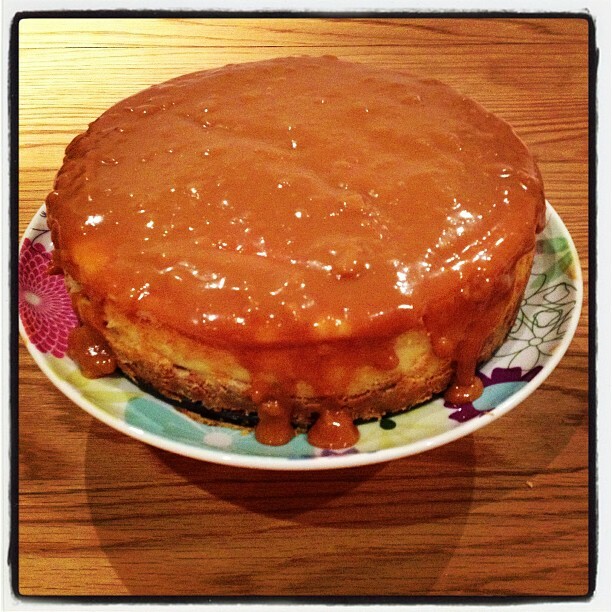 Alternatively, you could swirl the caramel through the cheesecake mixture before baking. When making a large cake, leave in the tin for about 10 minutes to cool slightly before removing to a plate. Don’t leave it to cool completely in the tin, as it will keep on cooking! The mini cheesecakes can be eaten whenever but if you peel them out of the cases, they look really lovely with the different layers, and would make a great dessert with some ice-cream and hot caramel sauce! 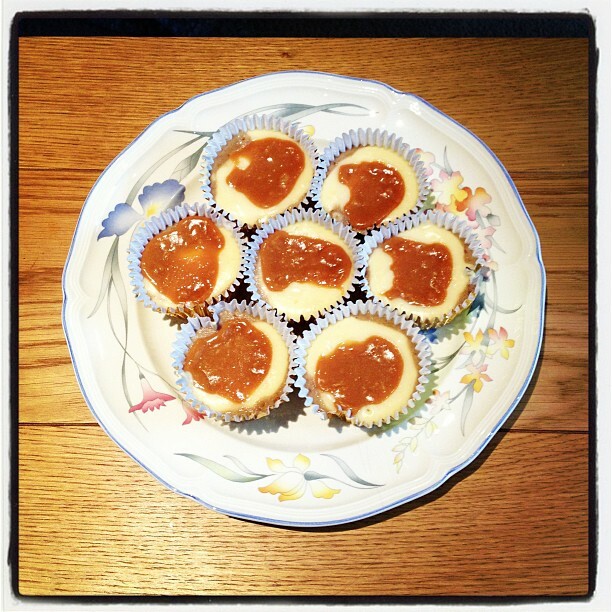 mini banoffee cheesecakes. Absolutely delicious at any time – and totally portable for any place! For the full cake version, I didn’t take my own advice, and failed to warm the caramel, which is consequently a little on the lumpy side, but nevertheless delicious! Well my baking friends, back wearing my non-baking, academic ‘hat’ for the foreseeable future. See you on the other side…..